Out Of The Park Developments (behind the long-running, beloved series Out of the Park Baseball) released the third installment of Franchise Hockey Manager on October 31st, 2016. 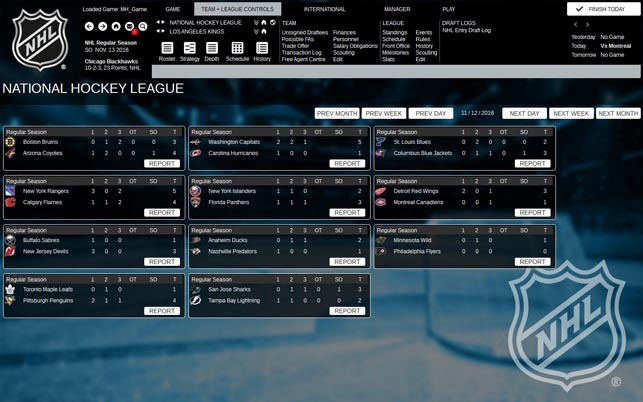 Officially licensed by the National Hockey League (NHL), Franchise Hockey Manager 3 (FHM 3) features all thirty teams, uniforms, logos, and rosters, in addition to 21 other hockey leagues from around the world. Placing you in the role of General Manager and Head Coach, you experience every aspect of being responsible for your team. 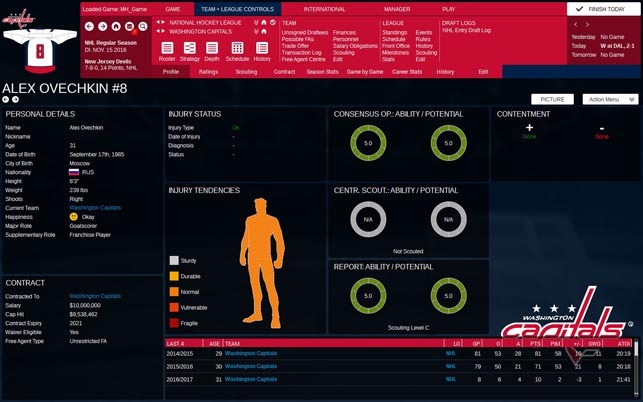 From trading, free agents, negotiating contracts, setting lines, keeping the owner happy, dealing with player injuries, and international duty, every aspect of the managerial career is represented in a realistic, immersive experience. In the new Path to Glory career mode, you start off virtually unknown, managing a small league team, trading for the best amateur players available, and slowly building your momentum through the seasons. As you progress, you build a reputation and climb the ladder, and bigger and better players and offers come your way; eventually, you're managing a team with international players and competing in the playoffs for the Stanley Cup. In addition, the historical NHL play is a wonderfully enjoyable mode which allows you to take the reins of your favorite teams, and guide them through seasons as far back as 1931. Outside of the NHL, all international leagues and tournaments are also available, expanding the horizons to all of the incredible hockey found throughout the world. The immersion found in FHM 3 is staggering. As games and late season approach, you feel the stress of making your team successful, you worry about losing your contract, and fear disappointing your fans. Even the reputation, seats, and sales of your home venue are taken into account. Daunting at First. Intuitive at Last. While the UI is at first daunting and confusing, it soon becomes easy to navigate and manipulate, making a smooth transition to easy control and success in your path. The simulation of the games themselves, while not particularly visually stunning, can still provide the thrill of watching a game, with penalties, scores, overtime, and even the hallmark of the sport: fights. The visual display and the event of the games are essentially a watching portion of the title, but this is not a “hockey” game, but a management game, which provides a fresh look on the idea from a new angle. An in-depth recap of each game is available after the game, showing which players performed well and which didn’t, helping you refine your roster, lines, and tactics. As you analyze and notice trends, you can change which players are dressed, what the lines are, what the strategies of your team are, and even the primary and secondary roles of each individual player. Each player also has a happiness meter, which will fluctuate based on the team and the player’s performance, injuries, and various other factors. As this happiness decreases, performance will decrease, and vice versa, adding another level to the feature-rich simulator. FHM 3 is a feature-rich, immersive, expansive simulator which succeeds in putting you in the shoes of a manager and coach, and gives you a sense of pride for success and growth and fear of failure and what that entails. 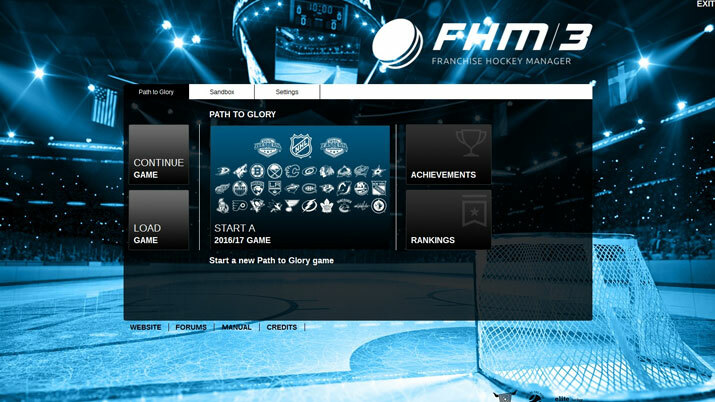 FHM 3 is great title for fans of sports simulators and hockey alike.